The Rifle, .303 Pattern 1914 (or P14) was a British service rifle of the First World War period that was principally contract manufactured by companies in the United States. During the Boer War the British were faced with accurate long-range fire from the famous Mauser rifles, model 1895, in 7x57mm caliber. This smaller, high-velocity round prompted the War Department to develop their own "magnum" round in 1910, using a .276 calibre round patterned from that of the Canadian Ross rifle. A modified Mauser-pattern rifle was built to fire it, the Pattern 1913 Enfield (P13); effective mass production was still a ways off when World War I started, to say nothing of the logistical nightmare of introducing a new rifle cartridge in wartime, so nothing came of this. Adapting the same mechanism to fire the standard .303 round led to the Rifle, .303 Pattern 1914 (P14), a competent design fed from a five-round internal magazine. The action was a hybrid of the Lee and Mauser actions, with the rifle half-cocking on opening and full cocking on close (this was due to rapid-fire related heating making the standard Mauser action difficult to operate quickly). The primary contractor (Vickers) was unable to produce more than a handful of rifles, so the P14 became a de facto afterthought. The SMLE therefore remained the standard British rifle during World War I and beyond. The need for additional small arms combined with a complete lack of spare industrial capacity led the British government to contract with two U.S. commercial arms manufacturers, Winchester, Remington and Eddystone (a subsidiary of Remington set up principally to manufacture the P14) to produce the P14 for the British before the US entered the war in 1917. However, each factory produced parts from their own designs, leading to interchangeability issues; Winchester was particularly troublesome in this regard, going so far as to refuse for months to change to the new Mk I* standard. Therefore, the official designation of the rifle was dependent upon its manufacturer: e.g., the Pattern 1914 Mk I W is a Mk I of Winchester manufacture, R would be Remington, or E for Eddystone. 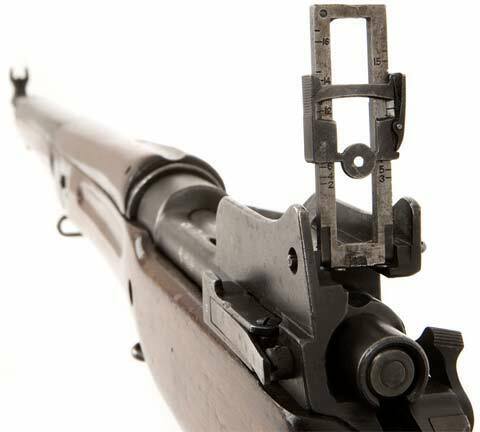 The P14's principal combat use during WWI was as a sniper rifle, since it was deemed to be more accurate than the SMLE at longer ranges, either in standard issue form or with modified or telescopic sights (modified and telescopic sights were used only on Winchester-manufactured rifles). When the U.S. entered the war, the P14 was modified and standardized by the U.S. Ordnance Department and went into production at the same factories as had produced the P14, production of that rifle having ceased, as the Model of 1917, commonly M1917 Enfield, chambered for the standard US 30-06 cartridge and enjoyed some success as a complement for the Springfield M1903 rifles which were America's official standard issue, soon far surpassing the Springfield in total production and breadth of issue. Prior to and during World War II, the P14 was used, after undergoing modification ("Weedon repair standard", formally the Mk II standard) in Britain as a rearguard rifle, primarily to equip the WWII Home Guard. The rifle was also used again as a sniper rifle, the configuration being different from the WWI incarnation. Additionally, the US also sent some M1917 rifles to the UK under Lend-Lease, though the different ammunition requirements limited use and necessitated clearly marking the rifles as being non-standard. The Australian Army also used some quantities of the sniper variant of the P14 during World War II.